The recent outbreaks of Ebola in Africa and the first case found in the U.S. have also heightened the FDA’s awareness of disease outbreaks and the need for stronger safety measures, but nothing gets investors salivating more that and constant media attention. Several public companies like Inovio Pharmaceuticals Inc (NASDAQ:INO) and Hemispherx BioPharma (NYSEMKT:HEB) have thrown their hats into the ring to become part of the Ebola conversation, but Tekmira Pharmaceuticals (NASDAQ:TKMR) continues to perform well for investors day in and day out. Actually, the developer of RNA interference (RNAi) therapeutics has become one of biotech’s best performing stocks since we first highlighted the firm as shares were trading at only $4.50, back in 2012. TKMR shares had seen a steady increase in value since that time, but we’ve seen that growth reach new levels since the firm’s own TKM-EBOLA was cleared for emergency use against Ebola in West Africa. The company has announced it will join an international consortium that will establish clinical development centers in Ebola hot zones and Maxim’s analyst Jason Kolbert said that his firm has accelerated their Ebola assumptions and as a result sees additional upside in the stock. In a research report just released to investors, Kolbert reiterated a Buy rating on Tekmira and raised his price target to $31 from $23, as the company announced the achievement of a development milestone, supporting a $1.5 million payment from Monsanto, for work outside of the pandemic space. That investors have taken notice of Tekmira during recent headline grabs is wonderful, but those have been following the company for any length of time will tell you that the firm’s true value lies in what most in the industry consider a clinically validated "gold standard" for RNA interference (RNAi) therapeutics delivery. While many experts have often said that "RNAi will revolutionize medicine" with its ability to turn off genes (thus enabling new drugs for dozens of diseases), the real challenge for the Nobel Prize winning technology has been delivery and that's where Tekmira shines. If you didn’t jump on Tekmira when we first recommended it, or even later after we told readers that a sell off along the way was overly exaggerated, then you may want to watch for the possibility of a slight correction before jumping in now. Tekmira shares hit $29.53 on Friday, putting them up +$4.06 (15.94%) but there are questions about how much longer the current run can continue before a slight pull back. The answer may be as simple as this: Unless there is a sudden, unforeseen development, probably not much longer. One has to consider both the most recent $31pps target analysis (shares are now trading just slightly under that price) and traders need to look at the technical indicators which are in play. 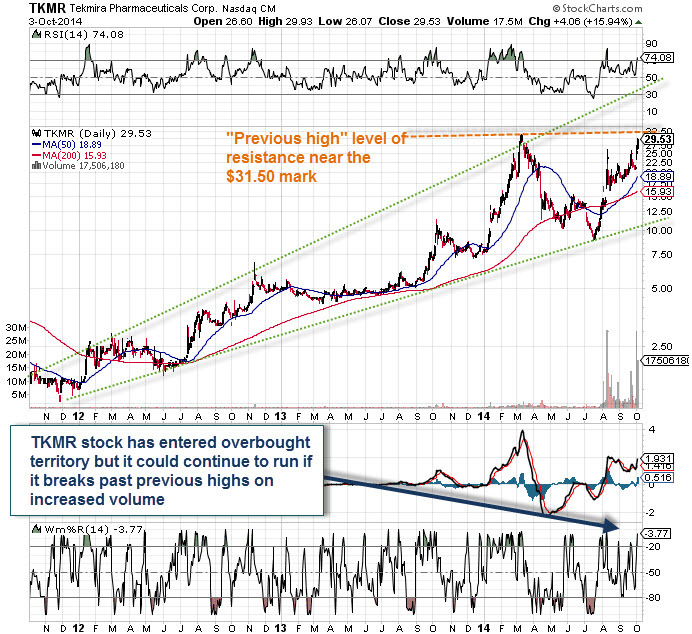 The TKMR chart shows that this stock is nearing a key level “previous high” resistance point right around the same price levels that the bullish analyst called for just days ago (around the $31.50 mark). Tekmira investors would, no doubt, be ecstatic to see shares break past that previous high and continue the beautiful uptrend we see on their extended chart, but wise biotech traders know to be cautions when prices approach levels like these. As a rule, if you’re buying into the euphoria, you could get left holding the bag. Sure, a sustained buying spree fueled by Ebola headlines may keep the volume pumping here, but if you’re absolutely set on playing risky Pandemic Stocks, you might be better served to look past the publicity bandwagon and instead look for real value in those companies who are keeping their head down, focused on critical work. 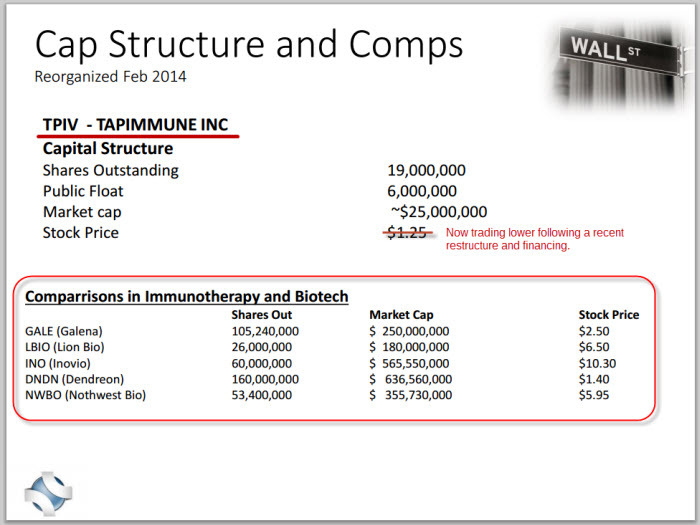 One strong candidate which has seen a quiet increase in activity/volume lately is tiny TapImmune Inc. (OTCQB:TPIV). 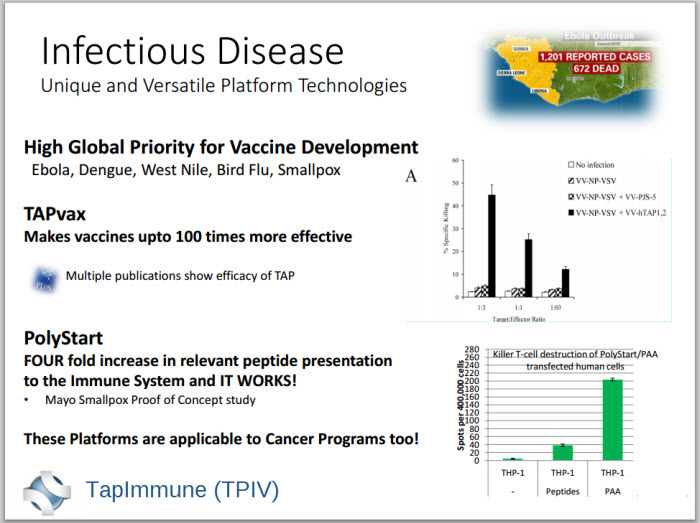 Like Tekmira, TapImmune offers investors an infectious disease side bet while serving up a main course of “new frontier” cutting-edge science-- in this case, a pipeline of multiple cancer vaccines showing superior results in human clinical trials. Those results strongly support progression to Phase ll and a very realistic shot at Orphan Drug Designation for multiple drug candidates in the short term. TapImmune, despite having multi-billion dollar product potential in Breast and Ovarian Cancer- two separate large market indications with clearly unsatisfied medical needs- has not been able to catch the attention of most investors. In fact, the Seattle based microcap has seen its share prices hit after a recent corporate re-structure and a financing deal which has armed them with new resources. That has not dissuaded at least some speculators from quietly picking up shares in growing volumes at currently discounted levels for what some believe to be a 5x to 10x opportunity. In fact, volume has been rising on the recent positive clinical data and since rumors began to spread that the firm’s PolyStart™ technology may be getting attention from bigger firms and government agencies- this after successful preclinical work at Mayo Clinic showed the platform can boost vaccine productivity FOUR fold, which becomes particularly relevant as the Ebola threat continues to spread more aggressively. PolyStart™, which was primarily, developed “in-house” by Bob Florkiewicz, PhD as a way of boosting the effectiveness of TapImmune’s existing Her2Neu and Ovarian Cancer vaccines, but it is such a versatile ‘plug and play’ technology, its potential for treating infectious diseases including influenza, H1N1, Dengue, and yes, Ebola cannot be ignored or overemphasized. Even as the platform is likely being prepared for an Ebola application, serious investors in the company have given kudos to the firm for not trying to jumping on the Ebola band wagon. Still, as this threat gains momentum and global panic grows, we believe the technology could play a major role in its containment and eradication given the right collaboration and partners- some of which are rumored to be circling. Those who understand PolyStart’s™ mechanism of action, say that it can increase the effectiveness of just about any vaccine and perhaps provide a platform countermeasure to bioterrorism. In short, the PolyStart™ expression vector is a significant advance in vaccine technologies which may not be ignored much longer. It’s worth noting that Florkiewicz, who serves as Senior Director of Molecular Biology & Virology at TapImmune,was at ID Biomedical when GlaxoSmithKlineagreed to buy the Canadian vaccine developer for C$1.7 billion. The way we see it, whether inferring from company presentations or street rumors about PolyStart™ as an infectious disease play out in the weeks ahead or not, the firm has made clear to investors a series of important pipeline milestones and catalysts which could certainly spur more buying and interest. Most recently, during their presentation at the at the 16th Annual Rodman & Renshaw Global Investment Conference, management also told investors that it plans to seek an up listing to the Nasdaq as soon as possible. That hints at, and would require, a significantly higher share price. Finally, when one considers that TapImmune has only 19M outstanding shares with roughly 8M in the float and that it trades at prices significantly lower than those of other players in the immunotherapy space by 5 or 10X, downside risk at these levels is certainly minimized.